Just how did I manage to crack the previously impenetrable wall of Minoan Linear A and manage to at least partially decipher several tablets in Linear A? I is quite apparent from my theoretical analysis of how I came to my conclusions that I was using my mind in much the same way as a quantum computer. But that should not be surprising to anyone at all who is deeply devoted to scientific research of any kind, because that is how the scientific mind fundamentally operates, and always has. in which I reference my most successful decipherment of any Minoan Linear A tablet, that of Haghia Triada HT 31, which I was able to decipher in its totality by means of retrogressive cross-correlation with Mycenaean Linear B tablet Pylos Py TA 641-1952 (Ventris). My successful decipherment of this keystone Minoan Linear A tablet has served as the effectual template for my partial decipherment of numerous other Minoan Linear A tablets. Unfortunately, I cannot release my findings to the world at this time, as my article, “The Mycenaean Linear B “Rosetta Stone” to Minoan Linear A Tablet HT 31 (Haghia Triada) Vessels and Pottery” is slated for publication in Archaeology and Science (ISSN 1452-7448), Vol. 16, 2018, and as such is sealed in secrecy to the reading public until such time as its release sometime early in 2018. So I guess you will all have to be as patient as I must be, even though I already have all the “answers” firmly in hand. In the meantime, the 2 figures from that article I have posited above should serve to whet your appetite. 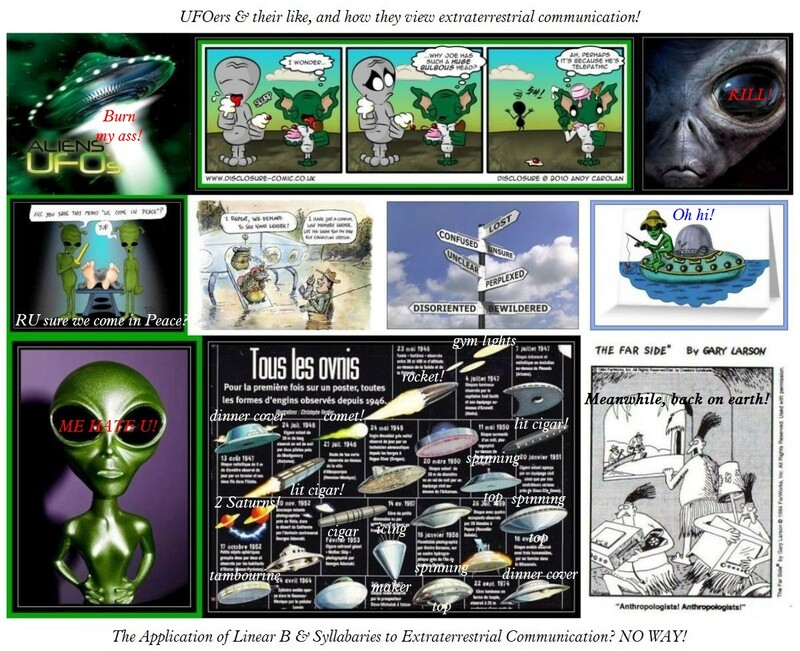 NASA, New MENU added to Reflect our Research into the Application of Linear B & Syllabic Scripts to Interstellar Communication: Click on this BANNER to see all these posts now. We have added our innovative, cutting edge NASA MENU (Category), which appears on the third line at the top of the first page of our blog. If you are at all interested in our research into the possible (or even probable) implications of any seriously competent scientific research into the Theoretical and Practical Applications of Linear B & Syllabic Scripts to Interstellar Communication, research such as we see conducted by NASA, ESA, the KEPLER missions, SETI or by any other official international space agencies or university-level research projects and the like, then this is the place you’ll definitely want to be. Ours is the one and only Linear B blog on the entire Internet, dedicated to Mycenaean Linear B, as well as to Minoan Linear A & Arcado-Cypriot Linear C, where such matters are taken seriously, but only at the academic, research level. We do not and shall never associate ourselves with crack-pot blogs and sites all in a kerfuffle about so-called UFOS, alien intelligences (usually deemed hostile) and other such riff-raff on the Net: Click to ENLARGE, at your own risk! These deserve no valid place whatsoever into the search for communication(s) with extraterrestrial intelligences, if any such exist at all, or if we go on the assumption, fragile as it is, that they might or may exist, that they would even bother to communicate with the likes of us at all. These and several other specific considerations, which can in some real way be scientifically investigated or adduced, will be addressed under the Category MENU NASA, as the need arises. We shall of course keep you apprized.